Popularly known as the ‘Clothing Man’, Anshu has studied mass communication and has a masters in Economics. Starting as a freelance journalist, Anshu left a corporate career in 1998 and founded GOONJ with a mission to make clothing a matter of concern and to bring it among the list of subjects for the development sector. Anshu’s work with GOONJ goes to a core challenge of our times; the growing gap between the urban prosperity & rural poverty. Bridging the massive gap of social and economic inequities between urban and rural India in an innovative way, Anshu has created a new dynamic focused on the receiver’s dignity rather than the donor’s pride. Anshu is an Ashoka and Schwab Fellow, a fact which points not only towards the innovation & wide replication potential of his ideas but also to his persuasive and powerful presentation of the work. 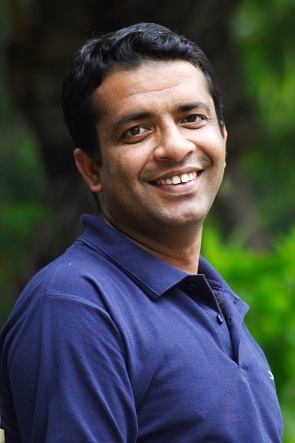 Anshu has been listed by the Forbes magazine as one of India’s most powerful rural entrepreneurs. His speech at several TEDx events across India and other Indian and international forums like the World Islamic Economic Forum, Jagrity Yatra, NASA, JICA (Japan) etc is admired by experts all across. Among many other honours, he has also been conferred with CNN-IBN Real Heroes Award. Prashant Sinha, PGP candidate and member of Utthan – social sensitivity cell at IIM Indore UAE campus had a candid discussion with Anshu Gupta about his initiative. 1) What does Goonj exactly do? GOONJ is a nationwide movement started 16 years ago in year 1998 to address the most basic but ignored need of clothing and the multifaceted role it plays in village India. GOONJ understands the connect between the struggle for the basics of life for the poor and village India getting left behind in the entire development happening in urban India. 2) Please tell us about your background before starting Goonj. I was born in Meerut and was the eldest of the four children in our family. My father was in MES ( Military Engineering Service) an allied branch of the armed force. We were posted all over the country. I studied mass communication (Journalism and Advertising and PR) and did a masters in Economics. I started as a freelance journalist right after my schooling . I used to write about history, monuments and humanitarian stories. Between 1992-1998, I worked with reputed organisations. My professional journey started as a copywriter with Chaitra followed by Power Grid Corporation and the last organisation I served was Escorts Communication. I left my corporate career in 1998 and founded GOONJ with a mission to make clothing a matter of concern and to bring it among the list of subjects for the development sector. 3) A graduate in mass comm and then a corporate career with a handsome salary. What made you think to start Goonj? Any personal experience that led to this decision? Elaborate your entire journey. It was on a winter night, as part of my freelance activity, I interviewed Habib – he used to pick unclaimed human dead bodies and get them cremnated. Habib’s little daughter told me, “When I feel cold during the night, I hug the dead body and sleep. It does not trouble me, it doesn’t turn around”. Her words made me think that how fortunate I am that I have never had to deal with clothing as a challenge in winters. The fact is, clothing is a basic need for everyone and many people like Habib’s daughter have a daily struggle for cloth to wear. During winter the condition becomes worse if people don’t have clothes to cover themselves. 4) Please share the challenges you have faced in terms of execution from inception till date. The biggest challenge I have faced or still face is to bring a change in mindset and attitude of people. Many a times it is very difficult to make the city residents understand as they are always fortunate to get fancy clothes. They have never seen a world where people are struggling for clothes. 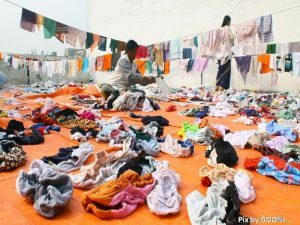 There are three primary needs for mankind (food, clothing and shelter), however ‘clothing is not considered an issue’. Clothing has lost its importance due to the huge number of brands and choices available. But many communities in India are still deprived of this basic need which most of us take for granted. 5) Please explain the entire model of how you are channelizing the city surplus to villages? What started as a small initiative has now grown into a mass movement among the urban and rural masses. We do collection drives across cities. Goonj’s collection includes things like clothes, shoes, toys, books and other urban waste. Contributed materials are divided according to gender, age, size and other demographic and geographic needs. Then we transport the segregated materials to the villages. There we, together with our grassroots partner groups, motivate village communities to work on their own issues and then get material as reward. Goonj also has a separate unit dedicated to making low-cost sanitary napkins which are reached out to rural women, while making them aware about the related health and hygiene issues. Today Goonj works across parts of 21 states with about 250 partner groups. It has 10 offices with 180 full time people and thousands of volunteers. We deal with around 1000 tons of material annually. 6) ‘Not Just a Piece of Cloth’ is a movement of its kind in our country. What made you start this movement and explain the impact? Most poor Indian women cannot afford commercially sold sanitary napkins and have to instead rely on things like dirty cloth, ash and even coconut husk – during menses. This neglect, not only makes these women susceptible to infectious diseases, but also impacts their education, earning capacity and general well-being. In 2005, we started an initiative, “Not Just a Piece of Cloth”, to provide clean cloth as sanitary pads for women. We collect reusable cloth from urban households, out of these the unwearable cotton cloth is used to make clean cloth sanitary pads (called MY Pads) for poor women. Goonj is using this innovative yet simple and familiar product to spread more awareness about the related and health and hygiene issues among rural women. On the whole NJPC is providing a dignified solution to a natural biological process which, in the absence of a clean piece of cloth, turns into a monthly disaster for countless women. The napkins we prepare are handmade, without any technological input. 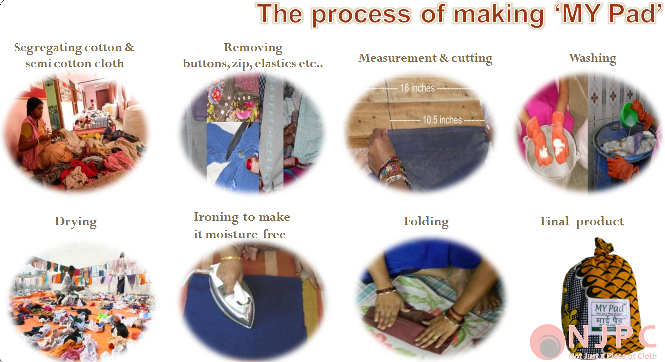 We employ women from nearby slums for the purpose. Moreover we try to spread the idea of live with dignity.There is also a big challenge of the deeply entrenched taboos and myths around menses due to which women.. even adolescent girls suffer a lot. The worst part is the shame ans silence associated with this natural process. This year we have intiated a global campaign NJPC – Million Voices to break this silence around menses. We hope to get a million people to talk about their thoughts, views and experiences on menses. The online site www.njpc.goonj.org is fast becoming a forum where men and women from all over India and the rest of the world are adding their voices to mainstream the issue, making to absolutely normal to talk about. 7) How Goonj is educating the villagers and needy people to adopt your programs? We conduct village-level meetings to engage with the village communities. Similarly to bring the taboo subject of periods out in the open, we talk to village women. Over the last 15 years we have found that village communities are very resilient, with high self esteem and a rich knowledge of their environment and resources. Even on the highly taboo topic of menstruation, initially some women may be averse to discuss but they open up after a few sessions. 8) How do you manage the funds for carrying out your activities? For the first five years of its existence Goonj operated without any major source of funding. We tried everybody, but came back empty-handed because we did not fall within their parameters of funding. But today, Goonj has a turnover of around 4 crore INR, around 40-50% of which comes from individual contributions reflecting a strong base of supporters. The rest is a mix of funds from sale of products, co branded campaigns and other self generated income. 9) You are known as ‘Clothing man’. How did this term come from? Goonj seeks to bring dignity to the act of giving. In doing so, we want to shift the focus from the donor’s pride to the receivers’ dignity. We certainly want to make clothing a matter of concern and it has to enter in the list of subjects to work on in the development sector. What Goonj does is by the people and for the people. I merely play the role of a facilitator. People have given me this term. 10) What is your message to readers especially management students? Education definitely helps one to understand the importance of the basic needs of life like clothing and also some deeper needs like dignity. You are tomorrow’s leaders and I firmly urge people to join us not with the sense of doing volunteering but take it as your duty. That’s why we never set any expectation within our team or from our volunteers. Join this movement and take it to every nook and corner of the country. Currently pursuing a regular two year MBA (PGP) from IIM Indore UAE, hoping to utilize the next two years to learn from the best business professors in India and Middle East before re-joining the professional mainstream, in a managerial capacity to continue my education with work experience and broadening my horizons.